National Park Service staff moved its collection of artifacts and exhibit features from Jaggar Museum at Hawaii Volcanoes National Park on Tuesday due to all of the dramatic changes taking place at the summit of Kilauea. Star-Advertiser. The Hawaii Campaign Spending Commission fined Hawaii Rep. Kaniela Ing more than $15,000 today for filing 23 false reports detailing his campaign contributions and expenditures dating back to 2011, using campaign funds to cover personal expenses and other violations of Hawaii campaign spending laws. Star-Advertiser. State Rep. Kaniela Ing will have to pay more than $15,000 for violating the state's campaign finance law. In a hearing Wednesday, the Campaign Spending Commission determined the Congressional District 1 candidate committed 32 violations. KHON2. Commission approves $15K fine against Kaniela Ing for campaign spending violations. Hawaii News Now. Here’s The Spending That Got OHA Incumbents In Trouble. A state audit said Office of Hawaiian Affairs trustees used their $22,200 per year personal allowances for questionable purposes. Civil Beat. Officials from all four Hawaii counties will meet today through Saturday for the annual conference of the Hawaii State Association of Counties at the Sheraton Waikiki and the Royal Hawaiian Hotel. Garden Island. Boat owners required to register vessels under new law. Governor David Ige signed HB 2596 (Act 48) into law, which requires certain vessel owners to apply for certificates of title within 20 days of becoming an owner, or establishing Hawaii as the state of principal use for the vessel. KHON2. Governor David Ige signed HB 2215 (Act 46) into law, which requires drivers to allow at least three feet of separation between the driver's vehicle and the bicycle when passing or overtaking the bicyclist. KHON2. Drivers beware: New law sets wide buffer zone for cars passing bikes. Hawaii News Now. Gov. David Ige will sign a bill today that invests $500,000 into computer science education in public schools and creates opportunities for students to learn STEM (science, technology, engineering and math) skills. Tribune-Herald. Governor David Ige signs a bill into law to rid public roads of abandoned vehicles. HB 2442, (Act 47), requires counties to take into custody any abandoned vehicle on a public roadway within 10 business days. KHON2. In an effort to improve Hawaii’s public roads, Gov. David Ige signed a bill Wednesday that requires counties to remove abandoned vehicles within 10 days of their abandonment. Tribune-Herald. Remains of U.S. service members missing from fighting in North Korea soon may be headed to Hawaii for testing and identification as part of early steps following the historic June 12 summit between President Donald Trump and North Korean leader Kim Jong Un. Star-Advertiser. UH Scientist Reports Promising Development In Alzheimer’s Research. His discovery is leading to ongoing efforts to produce a drug that could reverse the effects of the disease. Civil Beat. Patient with Legionnaires’ disease dies. Health officials are scrambling to find the sources of bacteria that caused four cases of Legionnaires’ disease over the past month and resulted in one death in Honolulu. Star-Advertiser. Patient with Legionnaires' disease dies, others may have been infected at hospital. KHON2. A patient died from Legionnaires' Disease on Oahu. KITV. Here’s A New Twist In The Honolulu Corruption Case. Recently unsealed court documents point to a questionable link between a suspect in a drug case and the Honolulu prosecutor’s office. Civil Beat. The U.S. Military is considering Kuaokala Ridge near the U.S. Air Force Kaena Point Satellite Tracking Station or one of two sites at the U.S. Army's Kahuku Training area for its new Homeland Defense Radar - sensory radar designed to detect and classify radars. KITV. Community Hears Proposals for New Missile Defense Radar. Hawaii Public Radio. Heeia Kea Small Boat Harbor receives a $38,000 security camera from NBCUniversal. Star-Advertiser. Heads up, hikers! The popular Lanikai Pillbox trail will be closed for 2 months. Hawaii News Now. Simon Treacy, president of the Howard Hughes Corporation in Hawaii, announced the appointment of three industry veterans to new leadership roles at Ward Village, a 60-acre master-planned community in Honolulu. Star-Advertiser. More than 1,000 Big Isle residents affected by Kilauea eruption register with FEMA. Star-Advertiser. Eruption shows no signs of slowing. Preliminary estimates show it has produced about 145 million cubic meters of lava — more than the last two eruptions in the area. Tribune-Herald. Lava 'bergs,' rapids and flows part of a bizarre new normal on the Big Island. Hawaii News Now. Things aren't getting any easier for the thousands of Big Island residents who have been displaced by eruptions and lava flows in lower Puna. Hawaii News Now. Hawaii County officials continue to look for a safe way for the public to see firsthand the 2,000-degree river of lava racing 8 miles to the sea — a lava “viewing platform” that Gov. David Ige hopes would boost Hawaii island tourism. Star-Advertiser. 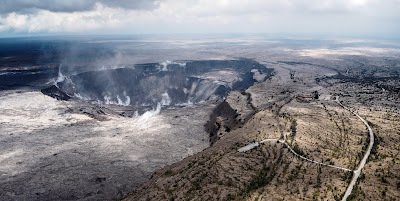 Hawaii Volcanoes National Park to host free events amid eruptions, ash falls. Hawaii News Now. Eruption Digest For June 20: More Vog Meetings, Citations, and Support. Big Island Video News. About $1 million has been redirected within the Hawaii Police Department to cover overtime hours piling up as lava continues to flow in Puna. West Hawaii Today. Lava’s ravages take a toll on residents’ mental health. Star-Advertiser. While government is still talking about how to house people displaced by the eruption, a Big Island church has already broken ground on a new village for evacuees. Hawaii News Now. Department of Health advises West Hawaii residents build clean air rooms inside homes. West Hawaii Today. Hawaii's Supreme Court is scheduled to hear oral arguments in an appeal of a decision to grant a construction permit for a giant telescope planned for the state's tallest mountain. Associated Press. The Hawaii County Council is considering a bill that would change the ethics code to state that officers and employees of the county government "shall be truthful." Big Island Video News. Nearly $2 million will be coming to the Natural Energy Laboratory of Hawaii Authority as part of a U.S. Department of Energy program funding efforts to improve desalination technologies using solar power. West Hawaii Today. The U.S. Department of Energy will award over $1.9 million in federal funding to the Natural Energy Laboratory of Hawaii Authority to test the viability of solar-thermal desalination on a commercial scale. Pacific Business News. Landmark decision restores flow in 10 Maui streams after more than a century. A landmark decision was made Wednesday in the largest water rights case in the state. KHON2. State Issues Decision on East Maui Interim Instream Flow Standards. Maui Now. Taro growers, practitioners elated with E. Maui water rights decision. ­17 streams restored by commission to full, near-full flows for farming, habitat. Maui News. On July 1st, a new law goes into effect in Maui County that makes it illegal to smoke or vape in vehicles with children under the age of 18 present. Maui Now. Fire Chief Jeff Murray is retiring at the end of the month, ending more than 29 years with the department, including the last decade as chief. Maui News. Kauai watersheds are getting a boost thanks to $6.5 million in Capital Improvement Project funding from the Legislature. Garden Island. Stream diversions are the topic for a meeting tonight at the Kauai Community College Performing Arts Center as the Commission on Water Resource Management meets with the public in a Wailua watershed fact gathering mission. Garden Island. Starting today, the County of Kauai Transportation Agency will be operating two electric bus demonstrations on the Kekaha and Hanalei mainline routes free of charge. Garden Island. RIMPAC battle lines forming. Garden Island.